A discussion of tools that make collaboration happen and deliver value to organizations. How does collaboration deliver value to companies? What kinds of software tools impact organizational productivity the most? And where, exactly, is collaborative value captured? Takeaway: At the file and team levels, people will always find a way to work together to get things done. 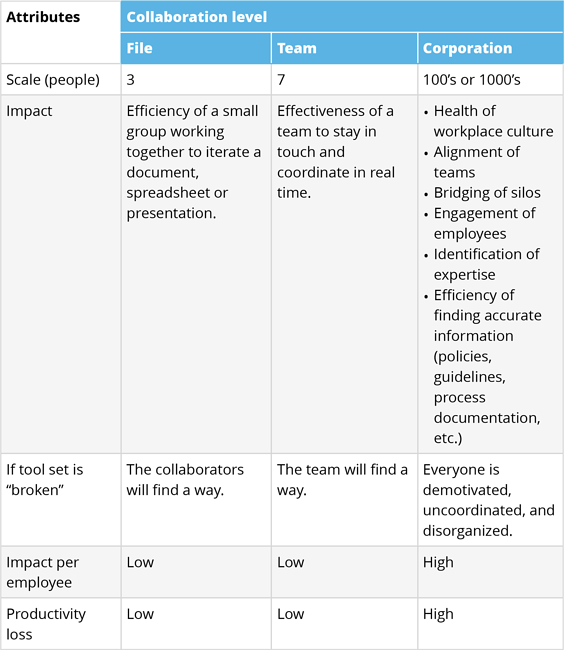 At the company-wide scale, however, a systematic approach is required. If you can find a way to help employees align, connect, and celebrate successes there will be huge impacts on productivity. ***Co-editing documents, spreadsheets, presentations, etc. Google Docs, Microsoft Office, etc. ****Specialized process-based tools. Time keeping, bug tracking, sales funnel, etc. Email is not going away. It’s the established workflow for many employees, and the best place to deliver app notifications. However, with the right deployment of enterprise-grade messaging, it’s possible to solve the “reply-all” email problem and to get team-level collaboration out of email. Email remains the standard for communication outside the organization. Document collaboration happens at a file level. Usually this involves a few people iterating a document or spreadsheet together. This is where cloud-based editing platforms like Google for Work and Microsoft Office 360 are indispensable. File shares will always be chaotic. They’re essential for creative work and archiving the knowledge of an organization. But they’re not the right place to reliably find the “official” copy of policies, design standards, budgets, forms etc. Those are best integrated into an intranet platform so they can be quickly and reliably found by all. Instant messaging is an important communication channel that can play a significant role in consolidating app notifications. However, instant messaging can run into five serious problems when you try to use it to connect an entire company: multiple tools, participation, push, noise, and reliance. The challenges of instant messaging in an enterprise setting are explored further here. Point solutions need to be optimized on a case-by-case basis. These solutions are often best selected at the team level — the right project management solution for a team building a structure is different from the right tool for building software. As point solutions become more app-like in nature, it becomes important for their notifications, and information on who is using what, to be shared via a messaging or intranet platform. Intranets are fundamental to connecting companies across teams and locations. They help teams align their plans with other teams. They help individuals recognize the value of their work in the context of how the company is changing the world. They help promote the values and culture of the organization scale across locations, bridge silos, celebrate successes, and recognize contributions. Often when companies look to improve collaboration they focus on tools that help individual teams chat and work on documents together. That’s useful, but the individuals making up a team will always find an effective way to work together. There’s no game changer in enabling isolated teams. When business leaders focus on collaboration, it’s the high-impact corporate level of collaboration they need to focus on. 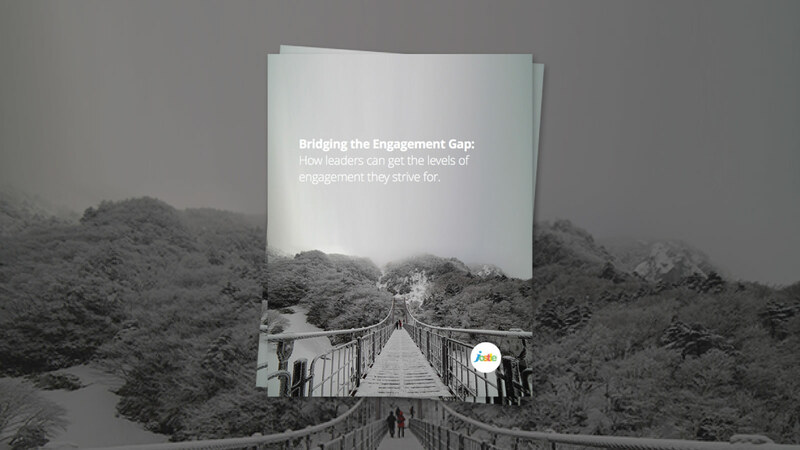 They need to find a way to achieve an effective intranet that will engage all their employees. Takeaway: A vibrant intranet is the key tool for pushing and surfacing information, and finding and discovering people, company-wide. If you don’t have an effective intranet, cross-team collaboration and alignment can become a struggle. Want an effective intranet to boost collaboration?